Cañar Chronicle 3: What’s for dinner? 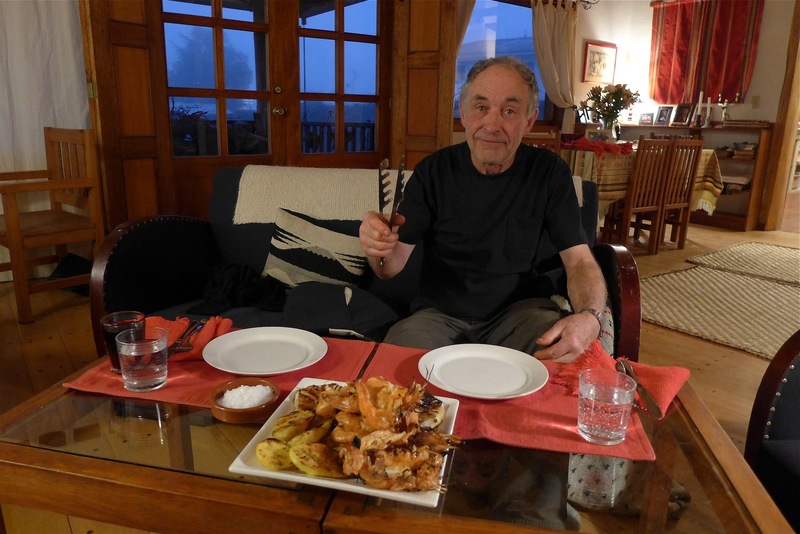 Some of you have wondered what Michael’s been cooking for dinner, so I thought I’d start there, as I know he would say, “So glad you asked!” Last Sunday, he came home in ecstasy from the market, having found fresh langostinos like he hasn’t seen in years. “Huge prawns, with the heads on, and only five dollars a pound!” he crowed, as he showed me one of the brute crustaceans laid out on a cutting board. “Hmm, could be an eight-incher,” I said, remembering the time he had insisted I take a photo of a giant prawn with a measuring tape. But he was already back in the kitchen, prepping for dinner. 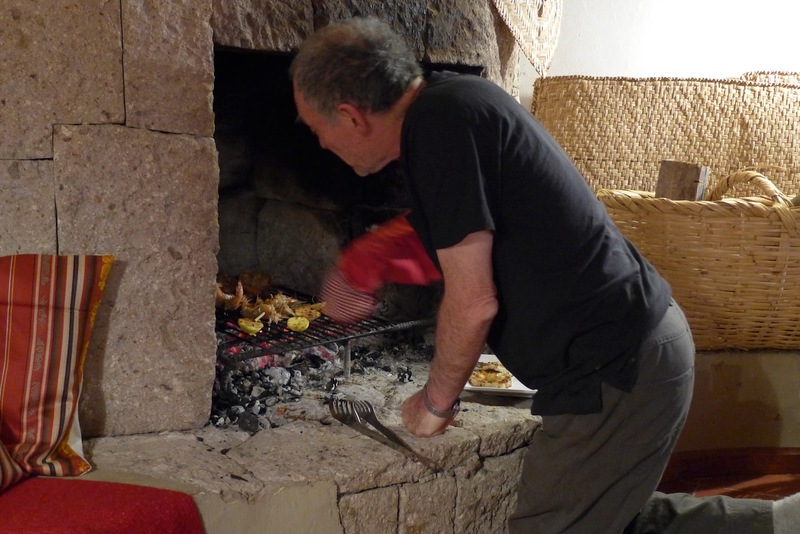 He’d also found a perfectly ripe pineapple (Sunday is the day when tropical produce comes up from the coast) and his plan was to grill the pineapple and prawns in our fireplace. This required building an elaborate fire at just the right time, about 5:00, so as to have coals perfectly ready for cooking, about 6:30. My job was to set the perfect table, or rather the two little tables in front of the fireplace where we spend every evening, this being our cocktail lounge, entertainment center (laptop, speakers, movies), dinner table, and the after-dinner hang-out until bedtime at about 9:00 or 9:30. “With a knife, split the prawns down the middle, belly side, leaving the heads on and just enough of the shell to make a hinge. Rinse those that look like they had a bellyful of something, but don’t devein. Butterfly prawns flat and skewer from the side, four to a skewer. Then I make a sort of aioli-based marinade with lemon juice, olive oil, sea salt and bit of black pepper and garlic. Put in mini-blender, and if you have the right mixture it looks just like aioli. With a brush, slather prawns on both sides with this marinade. Cut pineapple into ¾” slices, and lay on grill first. When almost done, slide onto one side and throw prawns on. With a hot fire, it only takes 2-3 minutes on a side. And now, since it’s another Sunday, let’s visit the market. The open-air weekly market that until a couple of years ago had always been in the streets along an avenue not far from our house. 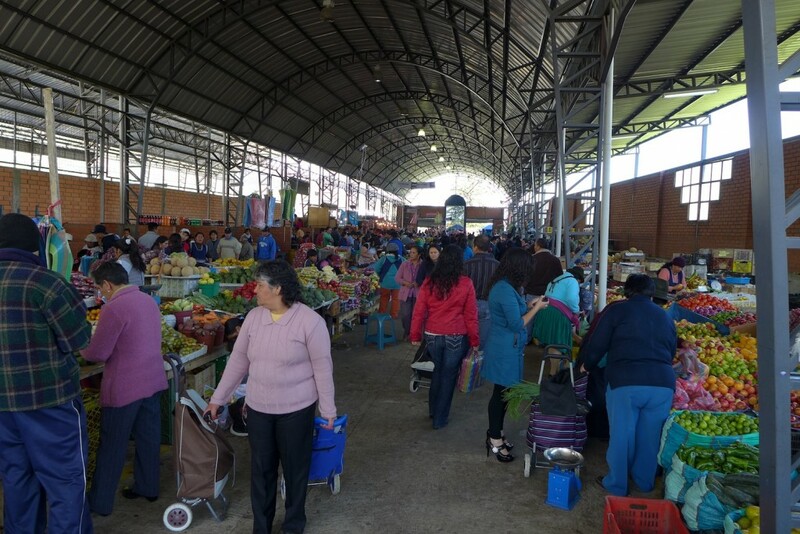 So when the Municipality of Cañar built a huge new market, some complained it didn’t feel right to have the market under cover (where it acts as a wind tunnel), and all in one place on the edge of town. It felt empty the first few times we went, but now the place is buzzing, full to capacity with produce vendors (all seemingly selling the same thing), lunch stalls with roasted pigs, rolling spice carts and plastics and household goods, with the surrounding streets full of vendors who don’t want to pay for a stall. The photo above is the small animal market, where country people come to town with sacks of live cuyes, rabbits, hens and roosters, and sometimes kittens and puppies, to sell in the plaza at the market entrance. 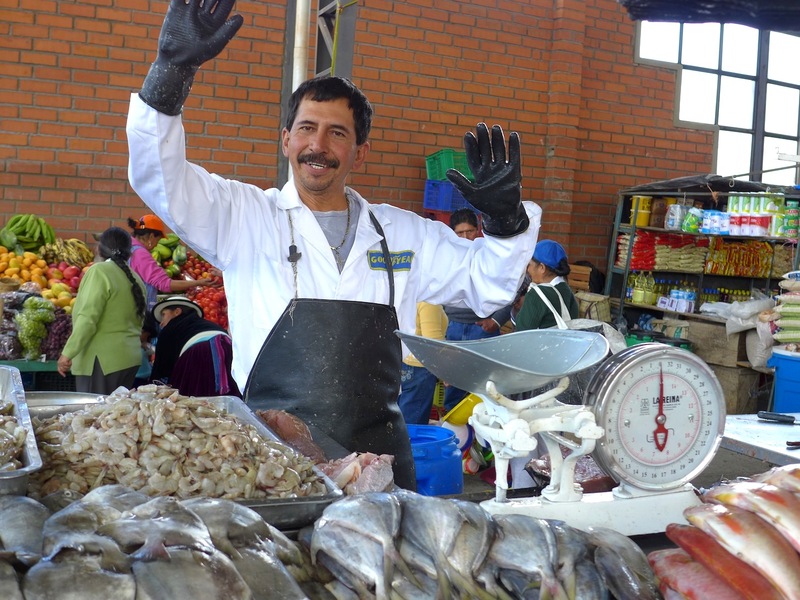 Here is Michael’s favorite fish and crustacean guy, César, who comes from Cuenca every week. 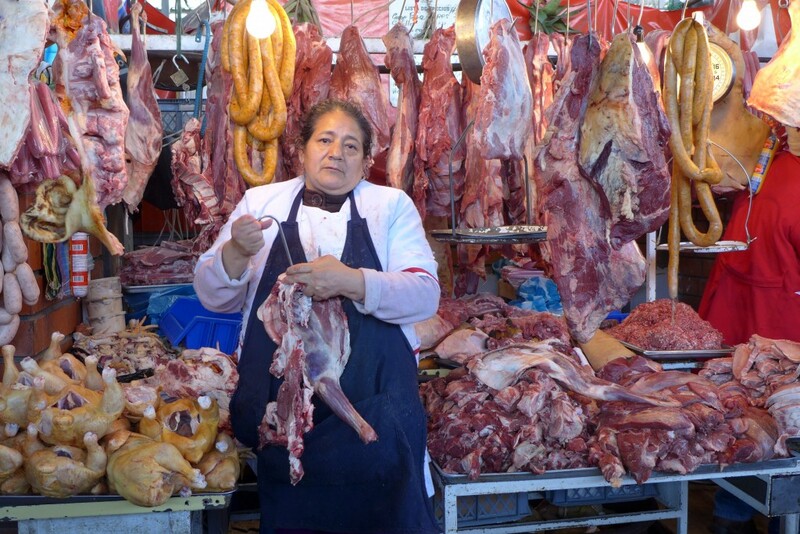 And his meat lady, who cuts him special thin strips for cecina, paper-thin slices of meat beef or pork, that he marinates for BBQ on the fire. Well, that’s my dinner and market report. Please let me know if you’d like to know about food and cooking in Cañar. 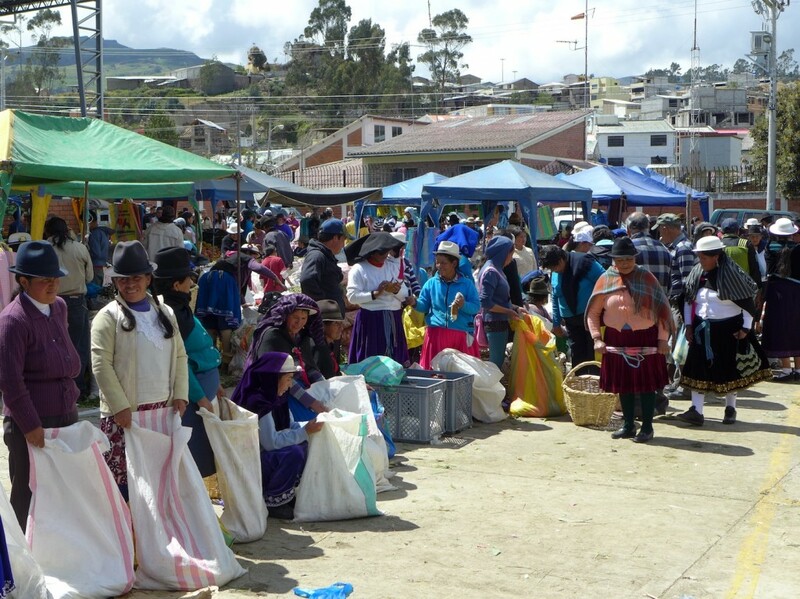 For example, how to prepare the perfect cuy, a staple of the Andean diet? Michael is not a fan of either cooking or eating cuy (guinea pig) but I’ve discovered lately – especially in the midst of a hard day’s work photographing a fiesta, say – that I can enjoy chewing on a tasty, well-roasted leg (excluding the paw), and appreciate what it means to have concentrated salty protein amidst the bland carbohydrates of potatoes and mote (hominy), other staples always served with cuy. And I promise to get better at food photography. How I envy you all that bounty! Michael really seems to have mastered the grill. I would love to hear more about local specialties, and what spices and fresh herbs are in use. Definitivamente al ver estos langostinos quisiera romper mi nuevo hábito de no comer estos animalitos. Me puedo imaginar como los ha cocinado Michael. YO tengo que ir a Ecuador. Tengo que ir a Ecuador, tengo que ir a Ecuador… Los ángeles de todos los universos ya tienen la solicitud hecha para organizar este viaje y espero que lo planifiquen pronto, ja ja ja ja!! !